There are two other names for LG Optimus L70 Manual. For example LG D325 or LG MS323 User Guide. For owner of this smartphone, please download the operating instruction in pdf format. 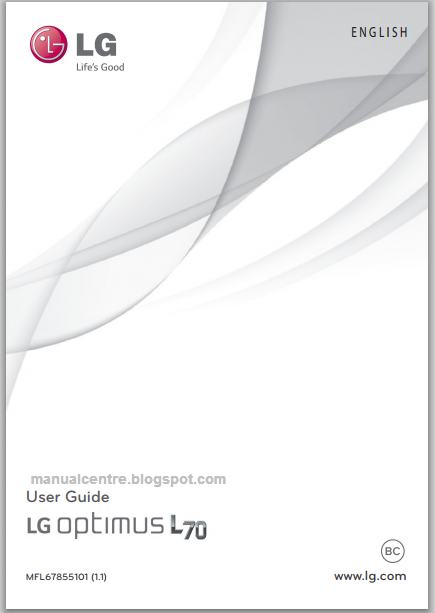 The LG Optimus L70 user manual consist of 114 pages (4.5 MB). This manual is available in english language. Some important information of this manual for example about troubleshooting via FAQ on page 102. Then about 10 Driver Safety Tips on page 95, safety guide on page 78, Phone software update on page 76, Back up my data, Backup account, Automatic restore and Factory data reset on page 72. In addition also provide detail reference information such as phone layout, using home screen, Installing the Micro SIM card and battery, Charging your phone, Inserting a microSD card, Locking and unlocking the screen, Changing the screen lock options with more security, using Wi-fi and bluetooth, USB Tethering, Smartphone Mobile Hotspots, Enabling Wi-Fi Direct to share through SmartShare, making a call, using contacts, Changing your message settings, using camera for Taking a quick photo, using Qslide, QuickTranslator, using ThinkFree Viewer, Browser and more.